The first time I had fish tacos was at a petrol station. Yes, you read that correctly. A petrol station. Just outside of Yosemite National Park, California, by the weirdly beautiful, faintly lunar-looking Lake Mono (if the Moon had water) stood the first petrol station for miles. An attractive petrol station with a grass covered verge scattered inexplicably with picnic tables, but a petrol station nonetheless. We stopped and filled up, but noticed that although there were lots of cars in the car park all of the people were in a queue for food. Well, it turns out that this petrol station has won all kinds of awards for its food, even getting on the cover of Gourmet magazine. We were up for a food adventure so queued for a selection of California specialities, including the intriguing fish tacos. Even though it was 11 am, and we weren’t really hungry, we still fought over the last remnants of this fresh, zingy dish that we ate at one of the picnic tables overlooking the lake. I’ve tried to reimagine our unexpected gas station meal with this recipe – with extra toppings and minus the deep-frying. If you are travelling on I-395 out of Yosemite, head towards Lee Vining and look out for the ‘Whoa Nellie Deli’at the Tioga Gas Mart – you won’t be disappointed. The entire menu looks amazing. This is one of our top five family meals, so thanks Chef Matt Toomey. The ingredient and equipment list looks a bit of a chore, but I promise it’s just a matter of organising your ingredients and doing some therapeutic chopping. To get you in the mood for your Cal-Mex feast kick off your work shoes and prise open a bottle of Dos Equis. If you have children who would like to help, perhaps have them mix together the chopped ingredients for the slaw and salsa, really diving in with their hands (!). They might also like to try their hand at coating the fish. What You Do: First of all make the accompanying toppings. 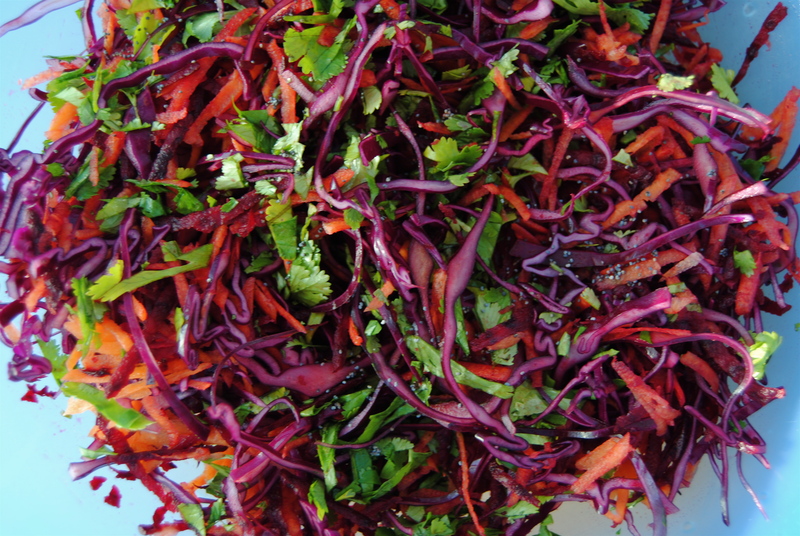 In a medium bowl mix together the cabbage, carrot, poppy seeds, half of the lime juice, half of the coriander and all of the ginger. Set aside. For the salsa, mix together the mango, pomegranate, onion, avocado, chilli, remaining lime juice, coriander and some salt and pepper, if desired. Set aside. Lastly mix together the sour cream and hot sauce, to taste, and season as you like with salt. For the fish, mix together the chili powder, oregano and lime juice; add the fish and marinate for 10 minutes to half an hour, turning halfway through. When you are about ready to eat, pour the maize meal on a large flat plate and mix in the salt. Heat the oil in a frying pan until a fleck of flour sizzles. 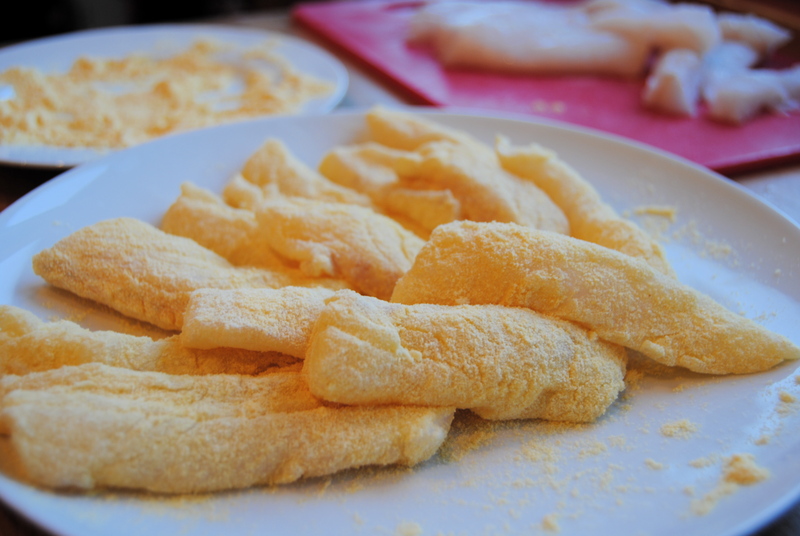 Pat the fish pieces into the maize meal and fry the coated pieces (in batches) until golden and cooked on both sides – about 7-10 minutes, depending on the thickness of the fish. Drain on kitchen roll and keep warm on a baking tray in the oven with the tortillas. I have also very successfully baked the fish: heat an oiled baking tray and slap on the coated fish; bake at 200 C/400F for five minutes, flip, and bake for a further five minutes (depends on fish thickness). We like to use the crunchy taco shells for the baked fish tacos, and the soft, non-fried tortillas for the fried fish but you, of course, do as you wish. Both are delightfully messy and fun to eat, especially for children. 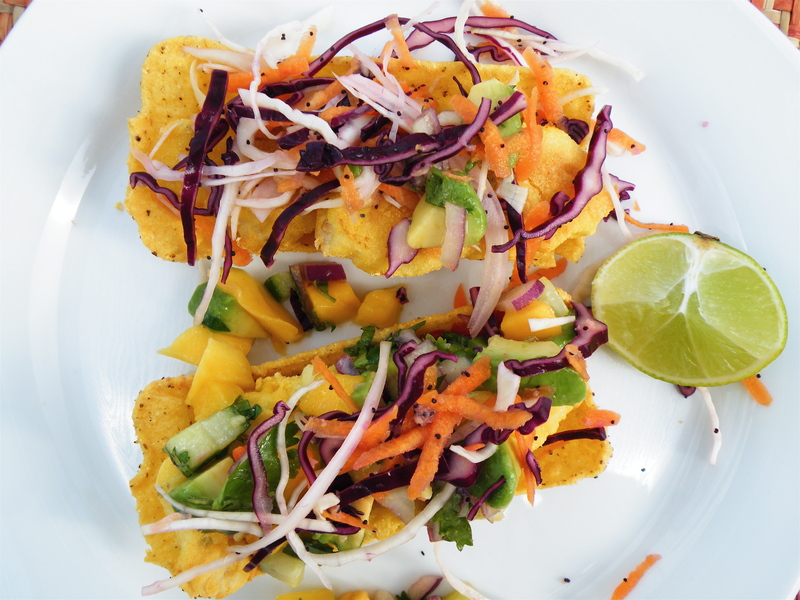 To serve, Put a few of crunchy fish strips down the centre of each taco, garnishing with the three toppings. Serve with extra salad and maybe some sweet potato wedges baked with cumin seeds and olive oil if you are really hungry. I am starving after reading this great post but am on a train to Glasgow & think my chances of getting a fish tacos with three toppings from the tea trolley is ….. remote. Perhaps there is a garage near Queen Street….. I would barely trust them with a flask of hot water and a KitKat, never mind a fish taco!